I started making this recipe during the mid-fall “crossover” season, when both fall and winter vegetables were newly available in the market and my chili plants were still pumping out their very last fruits before the frost. Hungarian Hot Wax peppers from the garden were a perfect match for the assertive flavor of the sprouts, but in the dead of winter I’ll use Italian frying peppers and a green jalapeño from the supermarket instead. This dish is just as delicious alongside a steak or piece of fish as it is spooned into tacos or served over steamed grains. 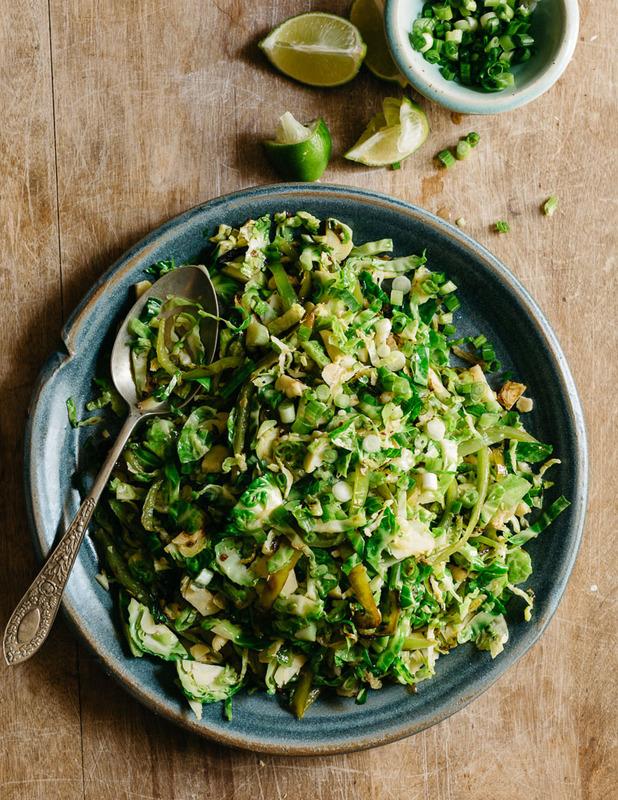 Using a sharp knife, sliver the Brussels sprouts crosswise, collecting any loose leaves, and toss with your hands in a bowl to separate into shreds. In a cast-iron skillet, heat 2–3 tablespoons olive oil over high and add the onion and cumin seeds. Stir to combine, then add the peppers and jalapeño. Sauté 2 minutes, until the onions and peppers begin to brown at the edges, then add the shredded sprouts. Cook 2–3 minutes more, stirring, or until the sprouts are bright green and also beginning to brown at the edges. Season with salt and pepper, stir in the scallions and the citrus juice, then spoon onto a serving plate. Serve hot. This recipe appeared in the Winter 2017 issue as part of a larger story on Brussels Sprouts.